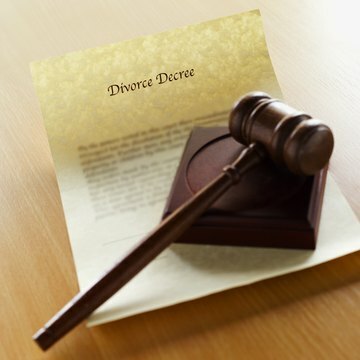 Divorce brings a marriage to a legal end and divides property between two individuals. Another issue decided in a divorce is the living arrangements and financial responsibility for any minor children. Both parents are obligated to provide for their minor children until the children become emancipated. Emancipation means that a child is considered financially able to care for himself. Emancipation occurs at different ages in different states. The most common age of emancipation is 18; however, in some states, it's 19 or when a dependent child finishes high school. In divorce proceedings, emancipation of a minor child means that child support obligations end for the parents. Some courts extend the emancipation period for child support payments until the child reaches the age of 19 or graduates from high school. Even when child support obligations end, some courts direct the parents to continue financial payments to cover four years of the child's college education. Some parents agree on their own volition to continue child support payments until they feel their child can financially support himself. Emancipation of a child also brings an end to the dependent tax deduction for that child. In a divorce settlement, the parents arrive at an agreement regarding which taxpayer will claim the child as a deduction of the year-end tax return. The Code of Federal Regulations Title 26 Section 1.152-4 states, "A taxpayer may claim a dependency deduction for a child, only if the child is the qualifying child of the taxpayer under section 152(c)." Typically, the parent with whom the child resides for a longer period of time during the taxable year is the parent who claims the child as a dependent. Once the child reaches emancipation and financially provides for himself, the child can claim himself on his own tax return. Courts grant emancipation earlier when children or parents present sufficient evidence that emancipation would be in the best interest of the child. Factors considered include the child's age and his mental and physical welfare. Courts are hesitant to grant emancipation early to children because parents are legally responsible for maintaining basic support to their children. Emancipation will not be granted solely because the parent no longer wants to be financially and legally responsible for their minor children following a divorce. Certain actions by the child can also bring about emancipation prior to reaching the age of emancipation given by state statutes. If a child gets married prior to the age of emancipation, the parent no longer is required to support the child. Another action is when a child enters the military. This act shows that the child is prepared to take care of himself legally and financially. Voluntarily leaving a parent's home also shows that a child wants to emancipate himself from the support of his family. Which Form Ends Child Support in California at Age 18? Both parents have a responsibility to provide for the financial needs of their minor children in California. When one parent asks for a child support order, the judge reviews the family's financial information and determines the amount the other parent must pay. The presumed father can terminate his obligation to pay child support by disproving paternity, and either parent can seek a modification based on changed circumstances. If not otherwise terminated, the child support obligation lasts until the child is emancipated. When one parent is paying child support, the support ends upon the child's emancipation, which is when the child can legally act as an adult. However, emancipation does not always occur when a child turns 18. State laws vary concerning emancipation. Furthermore, a divorce decree can order that a parent continue paying child support while a child is enrolled in college. For these reasons, it is essential that you carefully review your divorce decree and your state's child support guidelines prior to making any changes to your child support payments. Can Child Support Be Waived in Florida? What Is the Illinois Law on Age & Paying Child Support?